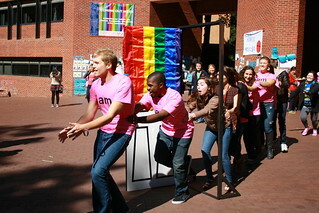 All day today, GU Pride is stationed in Red Square with over 300 free “I am” t-shirts and a door for students to walk through in support of LGBTQ issues, or even to come out of the closet. The group set up their yearly installment for National Coming Out Day at 9 a.m. and will be there till the end of the day. This is the second event in a series of October events during “Coming Out Month 2012″ to celebrate the lesbian, gay, bisexual, transgender and questioning people and allies. “It’s really a day to celebrate our identity,” President of GU Pride Meghan Ferguson (COL ’15) said. The celebration will end with a barbecue on Leavey Esplanade at 5 p.m. Other events for Outober Month include a lecture with Chairman and President of Export-Import Bank Fred Hochberg, one of the few openly gay senior officials in the Obama administration. GU Pride Vice President for Community Affairs Julia Maddera (COL ’13) added that Coming Out Day brings a sense of solidarity within the Georgetown community. “There are a lot of people who participate who have been out forever but there are other people who have just recently come out. Everyone is in a different place in their journey,” she said. National Coming Out Day is not just an opportunity to celebrate students who are part of the LGBTQ community, but also allies and supporters of gay rights. The smoke of Satan invaded Georgetown during the “Coming Out Day” events.